1. B has been a creative powerhouse lately! Recently she lugged my sewing machine up to her room and has been making clothes for herself and lot of other people too. 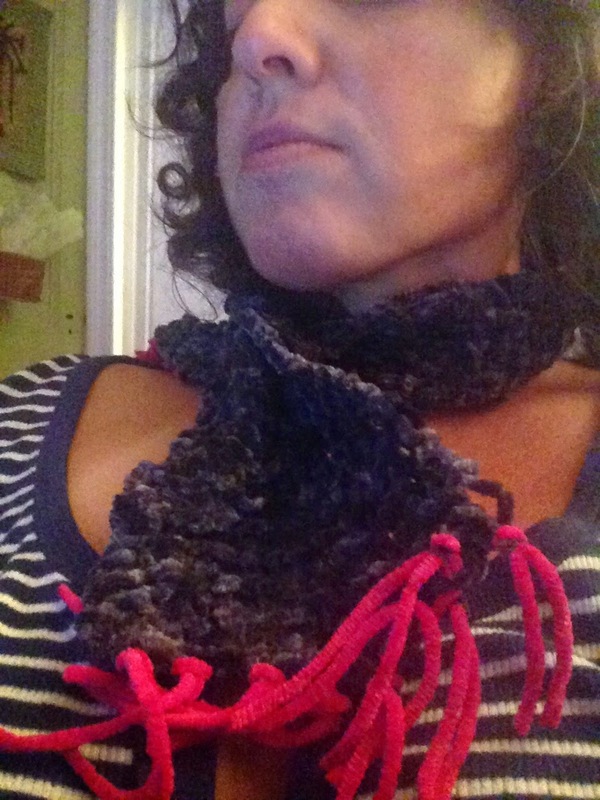 Getting back into knitting as well and made me a super cute and comfy scarf. 2. G never wants to go anywhere or do anything so I have to force him and then he has fun. Last time I told him to go to the school dance, he hung out with his friends, ate snacks, generally had a great time. This time I told him he should go and he said he'd rather stay home and read books. Knowing that he'd have fun if he goes (especially since one of his good friends that he never gets to see at school anymore will be there), I said, "Um. No." So he made this hat. Tonight should be interesting. 3. E is rocking the schoolwork this year. Math and spelling were both a bit of a challenge to him last year but it seems like something is really starting to click for him and I'm so happy, proud and relieved. 4. Z bought school lunch yesterday (they each buy once a month just for the novelty of it). I asked how the hot dog was, he said good, I asked if he had ketchup and he stared me straight in the eye and said, "You already know the answer." When I tried to repeat the scenario for my other kids (because I thought it was so funny) he watched me and said, "HEY! I didn't blink when I said it!" This kid takes his ketchup a little too seriously. 5. A has been crying at preschool drop off for however many seconds it takes for me to get out of sight (I know this because I hide around the corner and listen). We were almost to school the other day when she asked if I'd put her music on. I told her I'd make a deal with her and put her music on on the way home if she could try to be brave and not such a crying freakout when I said goodbye. Without missing a beat she said, "Actually, I like your music." (And a minute later, sounding quite satisfied with herself, said, "That mean I get to cry!!") Stinker.